Awhile back when I was at one of our local outlet stores I saw a pair of pink fluffy socks for $1 and I picked them up thinking I would make something interesting using them someday. 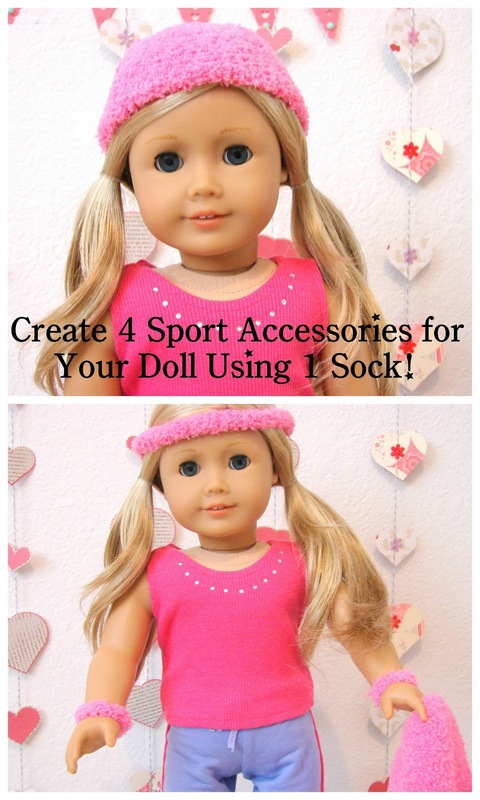 Well, that interesting thing ended up being some sports accessories for Zoey's doll! What's awesome about this project is that it takes 1 sock to make 4 different accessories for your doll and there is no sewing involved! You will start by taking one sock and setting it aside and cutting about half of the front portion of the foot off of the sock remaining. This will be your hat...go ahead and set this aside since it's done! Next, you will cut a strip off of the cut portion approximately 1/2 wide. This will be your head band. and then cut that strip in half. These will be your dolls wrist sweatbands. You simply tie the ends and trim the ends! This fabric is really forgiving and super stretchy so you can pull it out so there is plenty of room to tie. And then cut it on one side so that you have your towel for the gym (or for when your doll is done running outside or biking, etc.). Ta da! You now have a sweat band for your doll's head and wrists and a towel as well as a little beanie cap for when she heads for home so she doesn't catch a chill! I really love this idea. This is so cool. Thanks a lot for sharing this awesome tutorial. It looks cute and seems easy to make. I will surely give this idea a try. I am glad you shared this tutorial. Thanks for sharing. I love your ideas!! 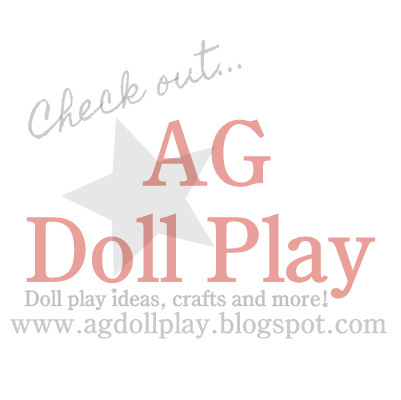 I go on your website every day to get ideas!!! I made these in blue. Sooo cute! Thanks for taking time for sharing this article, it was excellent and very informative. that doll is sooooooo cute! She is a Just Like You... right? Can you please tell me which doll is she? pd. The craft is awesome... I'll get my sock with no mate and scissors now!! !